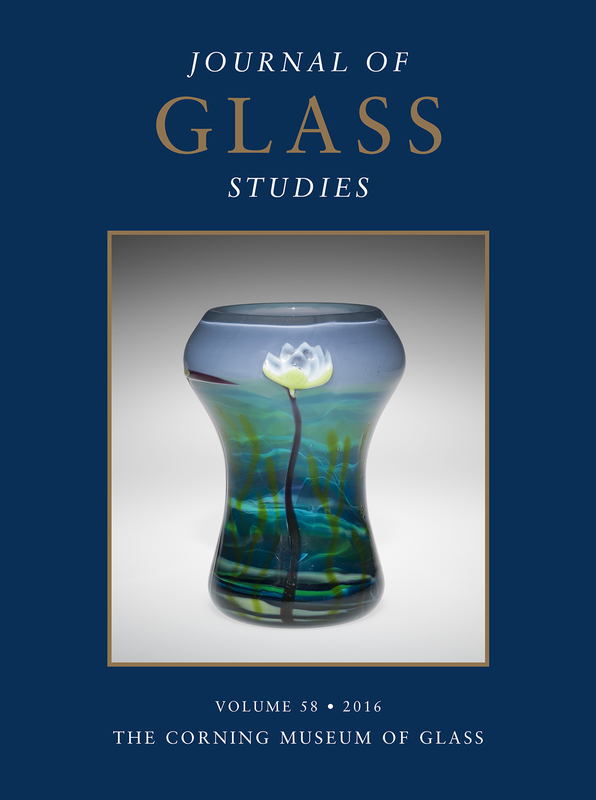 The Journal of Glass Studies is an annual publication that contains articles and notes of a scholarly nature on the art, history, and technology of glass, dating from ancient times up to the mid-20th century. The 2016 volume contains 14 articles that range in topics from four blue glass beads found at the prehistoric site of Gardom’s Edge in Britain to early Byzantine glass in the territory of Serbia and Kosovo to the arrival and reception of the works of the French artist and glass industrialist René Lalique. Four blue glass beads from the prehistoric site of Gardom’s Edge, in the upland area of the Peak District in Britain, were analyzed to determine their composition, date, and origin. The simple annular beads were of unknown date, although they were recovered from contexts that were either Bronze Age or Iron Age in date. The compositions of the beads are relatively unusual. They were manufactured with mineral alkalis, but they contain extremely low concentrations of impurities and were colored with copper. Comparison with other recently analyzed glasses shows (rare) parallels in Europe of Iron Age date, but not in the eastern Mediterranean (Egypt, Near East), which suggests an origin somewhere in the west. This is an extraordinary find in a marginal area, and it suggests far reaching trade and exchange networks. This article reports the results of research on a group of pyxides and their lids dating from the Hellenistic period. The unusual aspect of these objects is that the painted decoration appears on the interior. The “rediscovery” of one of these objects by the staff of the Centre Jean Berard (CNRS, Naples, Italy) in 2010 was the point of departure for this research project. This article discusses the origin, chronology, and geographic distribution of this group. Mold-blown beakers with mythological scenes have been studied extensively. About 20 new examples joined the lists started by Gladys Davidson Weinberg in 1972 and completed by Karol Wight in 1994. The novelty is based, not so much on the slow increase in finds during the last two decades, but rather on their location in southern France, where such beakers were barely known. These objects, which never come from funerary contexts, confirm the usual dating and demonstrate that Group II is still the most abundant and widely distributed. Today, the finds appear as numerous in the western provinces as they are in the eastern part of the Roman Empire. However, despite these new finds, this type of beaker remains one of the less-common mold-blown glasses, and its place of manufacture is still unknown. Aquileia is widely cited as a major Roman glassworking center, but this assumption is based on scarce archaeological evidence and supported by only a few indicators of production, mainly found out of archaeological context. This article discusses problems relating to the glass industry in Aquileia, presenting a new group of indicators of production, excavated in 2014, that includes fragments of a melting chamber, cullet, mosaic tesserae, and one glassworking tool. This new discovery, interpreted as a fourth-century context of glass coloring and recycling, is the first evidence of colored glass working ever investigated stratigraphically at Aquileia, and it adds new data to the complex picture of the structure of the Late Antique glass industry in the Roman town. The authors analyzed 15 glass samples by ESEM-EDS, demonstrating that glasses were recycled both by mixing mosaic tesserae with colorless glass and by re-melting or softening mosaic tesserae. In the territory of Serbia and Kosovo, glass fragments dating from the late fifth and sixth centuries have been quite common finds, but the forms used were few and simple. Finds from about 20 sites have been explored and published. The glass included different types of goblets and beakers, as well as oil lamps, while smaller numbers of bowls and bottles were uncovered. These vessels were made of greenish, yellowish, and colorless (with a greenish or yellowish tinge) glass; examples of blue and white glass are fewer. The glass was generally blown and only rarely mold-blown. Most of the vessels are undecorated. Where decoration is present, it is in the form of grooves, ribs, and applied threads or drops. In the late eighth century, the Roman Catholic Church issued regulations stipulating that the chalice and paten for celebrating the Mass ought to be made of gold or silver (or tin, in cases of poverty). Beginning in the early ninth century, glass was expressly named among the forbidden materials for this purpose because it is fragile, so there was a risk of spilling the blood of Christ if a chalice were to break. Although the ban on glass remained valid within the Catholic Church, it was (and is) occasionally disregarded, especially in poor parishes or during times of distress. There are indications that vasa sacra of glass existed in medieval and early modern times, and a number of simple glass chalices and ciboria dating from the late 17th century and later have been preserved. Within Protestant churches, there were no rules regarding the material of liturgical vessels. Glass chalices for the Communion were not prohibited, and since at least the 18th century, they were rather common in regions with Protestant populations and local glasshouses. This article surveys many known examples of glass liturgical vessels. This article presents a new approach to the archaeological and chemical evidence for glass in Africa, using the case study of 13th- to 19th-century Islamic glass bangles from the Libyan Sahara. The authors explore the technology of bangle production from a range of perspectives, beginning with a review of bangle making in its wider Asian and European context, and going on to discuss the ubiquitous but understudied Saharan glass bangle. The second half of the article provides new chemical data for 30 Islamic glass bangles from Fazzan, Libya, analyzed using EPMA and LA-ICP-MS. The discussion includes the dating of the bangles, evidence for their trade, and the possibility of secondary production practices, such as recycling and the addition of extra raw materials (e.g., potash and lead). The authors argue that, by focusing on secondary production and deliberate compositional manipulation of materials, as well as geological provenance, we are better equipped to use chemical analysis to reconstruct the long- and short-term meaning, manipulation, and trade of glasses in North and West Africa—an approach that may also be of value to those studying glass beads and other objects. This article focuses on four Venetian Renaissance pilgrim flasks decorated with coats of arms. A correct reading of heraldry on these vessels will help to date them more precisely. The first flask, in The Corning Museum of Glass, is decorated with the Rovere coat of arms. The authors propose a new date and a new dignitary as the owner of the piece, on the basis of the coat of arms and the enameled patterns, in response to a recent note in the Journal of Glass Studies that provided an incorrect identification of the owner and thus a wrong date. The second vessel, in London’s Wallace Collection, bears the Rappoltstein and Liechtenstein coats of arms, which are believed to reveal the recipient and the donor. The last two vessels, in the Musei Civici Medievale in Bologna, show the Sforza and Bentivoglio coats of arms, and they must be related to a marriage between the two families at the end of the 15th century. This article details the events surrounding the patent granted, in 1674, to George Ravenscroft for his “invencon” of “a perticular Sort of Christaline Glasse resembling Rock Christall, not formerly exercised or used in this our Kingdome ...” This glass is generally thought to have contained lead, a material that gave rise to what has been regarded as one of the greatest innovations in English glassmaking: lead crystal. The glass at that time was known as flint glass, and the author, based on contemporaneous accounts, argues that the crucial ingredient was flints and not lead—a conclusion overlooked by many historians. The new glass was prone to a defect called crizzling. It is suggested that lead was added in an attempt to cure this problem, and that it was only later recognized as a way to enhance the feel and appearance of the glass. In 1675, a Venetian businessman who had founded a glass factory in Genoa, in which a glassworker from Burgundy made sizable mirrors with the casting technique, asked the Inquisitori di Stato to return to Venice with this worker. This information allows us to advance the date of the invention of cast mirrors, ascribed to Bernard Perrot, by at least a dozen years. It is possible that Perrot initially sought to employ the casting technique for the production, not of mirrors, but of glass plaques. French glassworkers learned the blowing technique from Venetians, but in 1693 they began to create cast sheets. The casting technique was used in England and in Germany, but the Venetian glassworkers never abandoned the blowing technique. They continued to employ it in the production of small, thin, and smooth transparent sheets. More than 40 fragments of colorless glass from heavy baluster stem goblets were found in the archaeological excavation of the Casa dos Bicos in Lisbon, Portugal, in 1981 and 1982. This article focuses on 20 fragments from this collection, dated between the second half of the 1690s and 1755. The study was designed to identify the possible provenance of the goblets, based on the composition of the glass, as obtained by micro-energy-dispersive X-ray fluorescence, and the typology of the objects. The analyzed glass was determined to have a high content of lead oxide (25–39 weight percent), and a silica content of 49–59 weight percent. These heavy baluster stem goblets were typical of early English lead crystal production, and this archaeological set is, as far as we know, the largest ever found. A colorless Silesian footed beaker with wheel-cut and engraved decoration is described and analyzed in this article. The conical bowl is decorated on one side with a mythological scene featuring the nine Muses (all equipped with different musical instruments and dressed in costumes taken from opera seria), Apollo, Pegasus at the foot of Mt. Helicon, and a Spiegelmonogramm (mirror monogram) in a broad landscape. This scene appears above the Latin inscription “Et Mihi Pegasides doctissima Carmina dictant” (And I like the Muses to compose the most learned songs) and the date “1740.” The reverse shows an empty palmette, and the base of the bowl is faceted. The author suggests that the Latin motto allows us to conclude that the owner was a highly educated composer of opera seria or director of a musical ensemble in the year 1740. The initials in the elaborately constructed mirror monogram are “CHG.” On this basis, the author concludes that the beaker was made for Carl Heinrich Graun (1704–1759), the first Hofkapellmeister at the court of Frederick the Great, king of Prussia, in Potsdam. Graun, who was considered to be the most important German composer of Italian opera in his day, probably received the beaker as a gift from the court. A glass model of an octopus, donated to the National Museum in Prague by Leopold Blaschka in 1884, was recently damaged. Examination and analysis preceding conservation treatment enabled the authors to identify certain materials and techniques used to create the model. The production process is described in detail, followed by brief information about conservation. The octopus was assembled from blown glass parts coated inside and attached to an inner wire construction. The space between the glass and the wires was padded with cotton and paper, subsequently penetrated with sodium silicate. The thin skin between the octopus’s arms and connecting the arms to the head was shaped from a proteinaceous substance made of cotton soaked in pigmented plasticized gelatin. The surface of the model was painted and finally coated with nitrocellulose varnish. Conservation and restoration involved the consolidation of fractured glass and cotton stiffened with plasticized gelatin, as well as the filling and reconstruction of suckers, arm ends, and parts of the head. This article discusses the arrival and reception of the works of the French artist and glass industrialist Rene Lalique (1860–1945) in the United States, based on important, recently discovered documents from the personal archive of his son-in-law, the well-known American photographer Paul Haviland (1880–1950), in Paris. It addresses the questions of how we should regard Lalique’s art glass and to what extent industrial innovations, patent protection, and social circumstances played a role in his artistic developments. The article maps Lalique’s quest for the creation of so-called modern industrial luxury. Topics covered in this assessment include Lalique’s artistic developments in the pivotal period, about 1909, when his shift to glass was becoming unavoidable; his first all-glass presentation in the United States; and his activities during and after the war years (1914–1918). Thanks to a profusion of documents and additional finds, it is possible to provide a broader outline of Lalique—the man, the artist, and the industrialist—as well as the manner in which his output was regarded in the United States between 1900 and 1940.